AAP is a nonprofit professional association of 60,000 physicians dedicated to the health and well-being of children. AAP’s national conference brings together these committed pediatricians for networking and continuing medical education. LTD Creative has been working with AAP on their National Conference and Exhibition since 2008. In 2010, we were tasked with increasing the conference attendance through the creation of a branded NCE logo to identify the conference. This logo is used predominantly and in conjunction with the AAP corporate logo in all promotional materials. Each year, we develop the theme, concept and all promotional materials and implement a integrated marketing campaign that ties into the location. Materials include direct mailers, responsive emails, exhibiter and sponsorship materials, signage and all show location signage, website development, hosting and design, onsite conference materials, banner ads, promotional items and print and e-advertising. Doctors go above and beyond for the health and well-being of their patients and as a tie-in to the location of Chicago’s Miracle Mile and endless mile-high skyscrapers, a theme of “GO the Extra Mile” was developed for the 2017 conference. The typography was created using an italic san serf font and “GO” was set in all-caps to emphasize the word and subtle arrows were set at the end of the wording to give visual direction. Shades of green and orange were added for contrast and used as the primary colors in the palette. Tying in the NCE logo, we used stylized vertical arrow shape over on images of Chicago’s skyline. 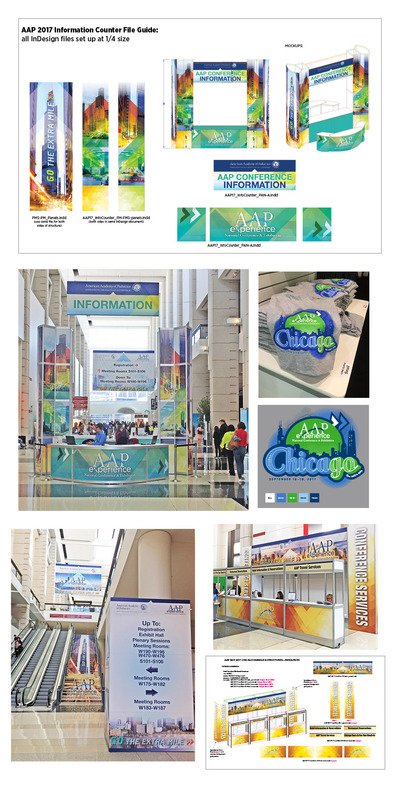 New, responsive email templates generated open rates of over 25% and over 14,000 national and international attendees came to Chicago to experience AAP’s mile high conference.